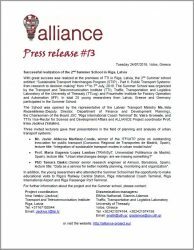 With great success was realized at the premises of TTI in Riga, Latvia, the 2nd Summer school entitled: “Sustainable Transport Interchanges Program (STIP) – Part II: Public Transport Systems: from research to decision making” from 1st to 7th July, 2018. The Summer School was organized by the Transport and Telecommunication Institute (TTI), Traffic, Transportation and Logistics Laboratory of the University of Thessaly (TTLog) and Fraunhofer Institute for Factory Operation and Automation (IFF). In total 25 young researchers from Latvia, Greece and Germany participated in the Summer School. The School was opened by the representative of the Latvian Transport Ministry Ms. Inta Rozenšteina (Deputy Director, Department of Finance and Development Planning), the Chairwoman of the Board JSC “Riga International Coach Terminal” Dr. Vaira Gromule, and TTI’s Vice-Rector for Science and Development Affairs and ALLIANCE Project coordinator Prof. Irina Jackiva (Yatskiv). PhD Tamara Djukic (Senior senior research engineer at Aimsun, Barcelona, Spain), lecture title: “Data as a service for better mobility planning, monitoring and organization”. In addition, the young researchers who attended the Summer School had the opportunity to make educational visits to Riga’s Railway Central Station, Riga International Coach Terminal, Riga International Airport and Riga Passenger Port Terminal.